Cloth diapers have been around for a long time (ha ha). I didn't use them with Pierce. 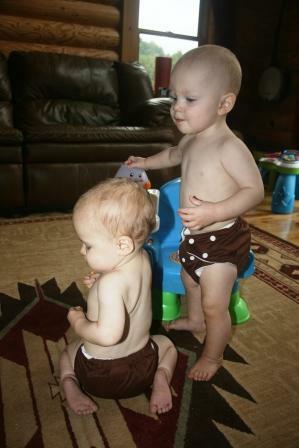 And about 2 days after I had the twins Paul suggested we try cloth diapers. "If you ever bring up cloth diapers again we're getting divorced". Luckily, he knew I was joking...about the divorced part at least. So a few of months ago things got to a good place with the kids. Suddenly, everyone was sleeping well and the twins were eating more solids and life just got simpler. That's when it occured to me - I could try this cloth diaper thing. If nothing else, they would be useful for times of diaper rash. And it wouldn't have to be all-or-nothing. That's when I started asking around for recommendations and suggestions. Thanks to my fellow blogger moms and my cousin-in-law for some awesome information over the past few months. Armed with all this feedback, I decided the route that made sense for us was a one-size pocket diaper. And I received so much feedback on brands. It seems that there are many, many excellent brands (and I hope we get the chance to try several of them). But the one that seemed tried and true, that I heard about over and over again were the Fuzzibunz. So for their first birthday, the twins are getting a few Fuzzibunz. I have to say, I had absolutely no idea how soft they would be. Soft enough to sleep on - or um, in. So last night the twins slept in cloth diapers for the first time. I just knew they would wake up crying and soaked in the middle of the night. We didn't have a single leak. Yes, the inserts were soaked but the diapers contained the moisture 100%. And hello, they look cute too! And so begins our journey into the cloth diaper world. I can't promise to be 100%. I think for us, it makes more sense to return to disposable diapers for travel and all-day outings. But for home, my boys will have the softest bottoms I've ever experienced. Not to mention - equally important - we get to significantly reduce our carbon footprint. I loved cloth diapering and the softness was the reason. I wouldn't want to wear paper underwear, so why would I put it on my baby? Boy! They sure have come a long way from birds eye cloth rectangles and crinkly plastic pants! I went over my pattern last night and figured out how I can make a pocket diaper. I may try them with Grady first since you already have Fuzzibunz. I can't believe they didn't leak at all over night! The one's I got Grady (Gdiapers) leaked after 2 hours. Luckily I only bought two pairs and didn't waste a lot of money. 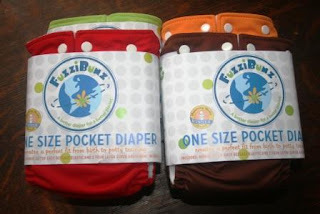 I will have to invest in the fuzzibunz. I know there are a LOT of cloth diapers out there. Those sound pretty good, soft and leak proof! What's not to like!?! So glad they worked well for you! Their little fuzzy butts look so cute in that pic! Good for you! My brother is 13 years younger than me, so I have memories of changing his cloth diapers and washing them out, etc. I never thought twice about it—that's just the way it was. I honestly don't know if cloth diapers were my parents decision to save money, protect the environment, or maybe disposable diapers weren't a big thing back then (?) I'm going to have to ask them. My older sis uses cloth diapers and likes them, but she waited till her kids were past the point of needing hourly changes :-) It was just too crazy when they were first born! That's awesome that you found a brand you like!